When I decided to buy an outdoor activity table for Kate, I did lots of research. I knew that she LOVED playing in the sand, but didn’t want to necessarily build a ‘real’ sand box in our back yard. So, I went to Amazon.com (of course) and started reading reviews on all the different brands of sand and water activity tables out there. Many of the brand names that I normally would have trusted to make a good quality table got bad reviews and so I wound up purchasing the “Naturally Playful Sand and Water Activity Center” by Step 2 and I’ve never regretted it! 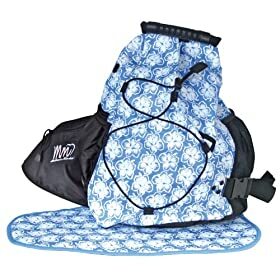 Granted, it’s not my dream bag (I’m still in love with the whole DadGear line of bags), but it’s still a great bag, especially for the sale price of only $16.83 on Amazon!